For each tree, place small amount of frosting between backs of 2 wrapped Santa candies; attach to bottom of cookie with small amount of frosting. Spread rim of cone with small amount of vanilla frosting. 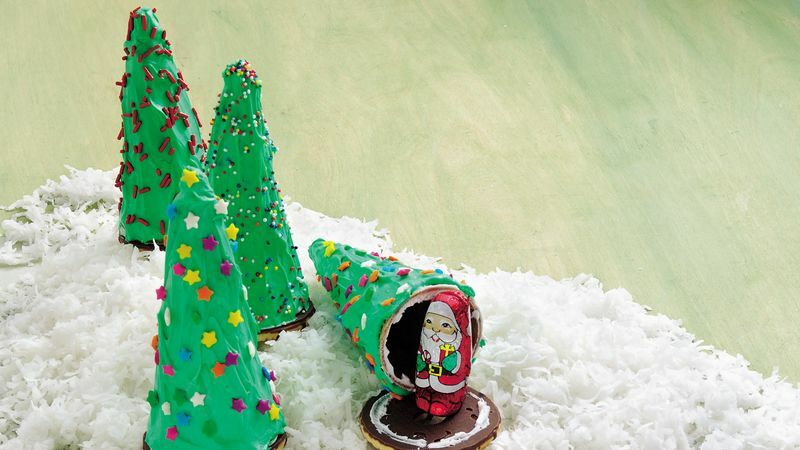 Attach over Santa to 1 cookie, chocolate side to cone. Stand upright on tray. Let stand 5 minutes. Stir food color into remaining frosting; frost each tree with 3 tablespoons green frosting. Decorate with sugar sequins, crystals or decors as desired. For frosting to be firm to touch, prepare the day before serving. Attach Santas on bottom of fudge-striped cookie with a small amount of frosting. Spread rim of cone with frosting to attach to cookie.